In July, a new cluster of 16 Japanese restaurants will open on the fourth floor of the Isetan department store in Wisma Atria, many of them the first overseas branches of popular eateries in Japan. Called Japan Food Town, its tenants include Sushi Takewaka, which is opening its first outpost beyond the 28-year-old shop in Tokyo's famous Tsukiji market. The Singapore outlet will serve sushi made using more than 20 types of fish, including hon-maguro and sea bream. Another highlight is udon restaurant Sato Yosuke, which has a 150-year-old tradition of serving handmade Inaniwa udon, a thinner version of the noodles. There is also Nabe Seizan, an offshoot of two-Michelin-starred kaiseki restaurant Seizan, which is in Mita, Tokyo. It serves Japanese hotpots featuring a dashi stock. Diners can also tuck into fried chicken from Rang Mang Shokudo, a Tokyo chain known for its buttermilk-marinated chicken; or sip sake from Dassai, a prestigious sake brand from Yamaguchi Prefecture, which will open its first overseas bar here. The restaurants have been selected out of more than 100 shortlisted ones in a Japan-wide search last year. So far, all but one of the 16 eateries have been confirmed. Japan Food Town aims to showcase the best of Japanese food culture. The $8.5-million project is a collaboration between the Japan Association of Overseas Promotion for Food & Restaurants and the Cool Japan Fund. The fund, which is backed by the Japanese government, supports projects that promote Japanese goods and culture overseas. More than half of the set-up cost of Japan Food Town were borne by the Cool Japan Fund, says Mr Nobuyuki Ota, 62, its chief executive. The restaurants were chosen for their heritage, service, quality of food and speciality dishes, he adds. Japan Food Town joins a crowded dining scene in Singapore, which has more than 1,000 Japanese eateries. But Mr Makoto Yoshikawa, 39, Japan Food Town's managing director, says through a translator: "I feel that there's still space to showcase authentic Japanese food." To differentiate Japan Food Town from its competitors, about half the ingredients will be imported from Japan. Seasonal specialities and other new Japanese food products will be a regular feature. Examples include Matsusaka beef, bluefin tuna from Osaka, Inaniwa udon and Kinmemai rice polished with a special technique. Mr Yoshikawa says that Japanese food is expensive in Singapore - meals at izakayas (Japanese pubs) here cost more than twice the price in Japan. Prices at Japan Food Town, however, will be affordable, he says. Prices start at about $10 for fried chicken to about $100 for Matsusaka steak. Despite the competitive food and beverage scene here, he says the business is in it for the long haul. He says: "We will persevere; we are committed to making this a success." This eatery uses fresh produce from Kyushu and serves signature dishes such as deep-fried black pork. This shop, which is from Tokyo, sells onigiri (Japanese rice balls) which are made with Kinmemai rice, a low-calorie brown rice. Sip on sake such as Dassai 23, which has peach and melon notes, and sake-based cocktails such as the Sakura Sling, which commemorates the 50th year of diplomatic relations between Singapore and Japan this year. It will also be served in the Long Bar at the Raffles hotel. This off-shoot of a restaurant in Tanjong Pagar offers Hokkaido delicacies using produce from towns such as Yakumo and Akkeshi. 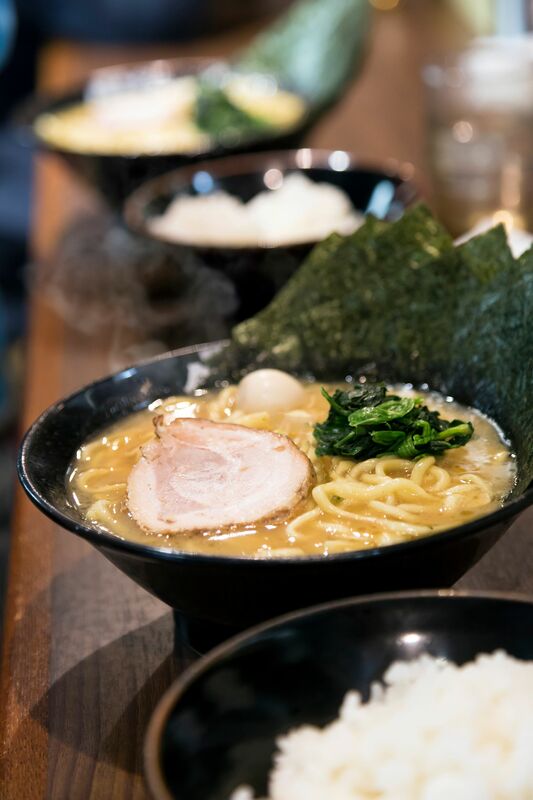 Slurp up its signature ramen (below), cooked to diners' preferences in a tonkotsu shoyu broth, and served with a bowl of rice. This eatery, which specialises in nabe or Japanese hotpot, is an offshoot of two-Michelin-starred kaiseki restaurant Seizan in Tokyo. The Japanese-style fried chicken chain from Tokyo serves double- fried chicken that has been marinated in buttermilk for six hours. Savour saba or mackerel from Aomori Prefecture here. Started in 1997, this eatery serves hotpot dishes such as shabu shabu and sukiyaki. 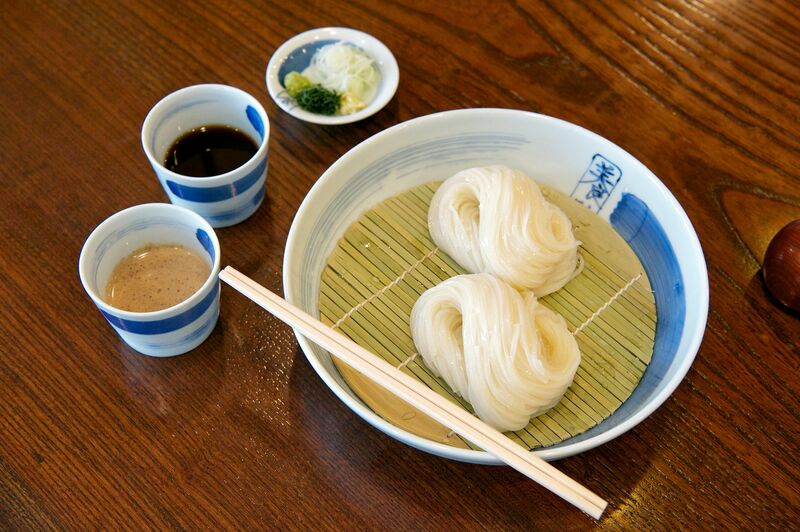 The shop specialises in Inaniwa udon (below), which is known for its smooth texture. The thin and chewy noodles are handmade in Akita Prefecture. The 28-year-old sushi shop from Tokyo's Tsukiji market serves 30 to 40 types of sushi using more than 20 types of fish. It also serves deep-fried items such as sea urchin tempura. This restaurant, which serves tempura and donburi, is run by the Tokyo Sushi Academy, a sushi school in Chinatown Point. Get transported to Osaka with dishes such as teppanyaki-style wagyu beef and okonomiyaki (savoury cabbage pancakes). The restaurant is known for yakiniku using quality beef such as Matsusaka beef from Japan. The noodle joint, which attracts long queues at its Tokyo store, serves soba bowls topped with vegetable tempura.